MSSU Athletics and RSVPaint have teamed up to Express Your Lion Pride On Canvas! Joplin, Mo. 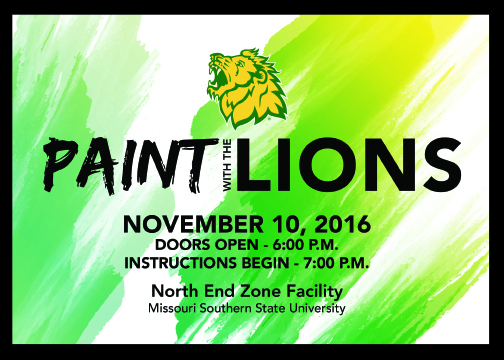 — Join us at Thursday, November 10th in the new North End Zone Fieldhouse at MSSU’s Sports Complex for a fun and entertaining evening of Relaxing, Sipping, Visiting, and Painting. No Experience Necessary! The talented artists of RSVPaint will guide you through the very simple yet fun steps to paint your lion with pride in your own creative style. Doors open at 6pm with snacks and a cash bar, instruction begins at 7pm sharp. Don’t be late! Cost is $50 in advance and includes two drink tickets. To secure your seats; fill out the registration form below, choose the “Pre-Pay” option in the ticket options. Let us know how many tickets you need. If you are joining some friends whom are registering separately, we’ve provided a space for you to let us know. So we can try to seat you together. Pay with any major credit card and receive a confirmation email that will let you know more about the event, directions, and more.